GOD'S OWN (AUS) (Bay 2002-Stud 2006). 3 wins-1 at 2-to 1600m, MRC Caulfield Guineas, Gr.1. Sire of 395 rnrs, 230 wnrs, inc. SW Brook Road (Qld Tatt's RC Travel Associates Classic, L), By the Grace, Inner Warrior, Bel Thor, Balzeus, Vatican, Utah Saints, SP Sirbible, Divine Moon, God's in Him, Pillar of Creation, Thunder Rain and of Concrete Johnny, Rod's Opinion, Father Ned, Putyourfaithinme, Alaskan Wolf, Bolord, Atlanta Dream, etc. APPREHEND (g. by Hold That Tiger). 8 wins-1 at 2-from 1200m to 2600m, A$525,388, Werribee Cup, L, VRC Comedy King H., TAB Big 6 Mega Jackpot H., MRC Slickpix Cup H., Allan Wicks H., MVRC Mitchelton Wines H., 2d VRC Bagot H., L, TTC Gold Sovereign S., L, MVRC Triforce Services H., Hambros & Cahill Lawyers H., Ladies Invitational H., United Refrigeration H., 3d VRC Talindert S., L, MRC Heatherlie H., L, VRC Bitalli H., MVRC PFD Food Services H., 4th MRC Naturalism S., Gr.3. Faerie Whisper. Winner at 1100m in 2016-17, 2d WATC Crown Towers P., Club Membership P., 3d WATC Lavazza P.
Risevata (g. by Benicio). 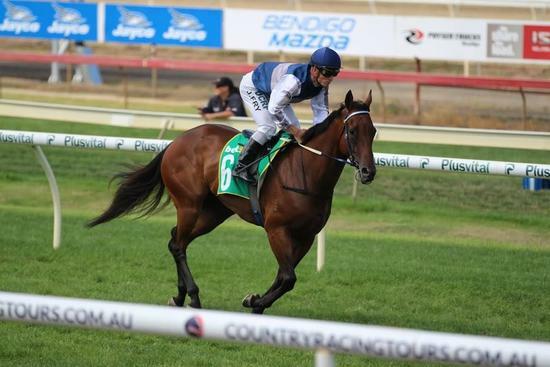 2 wins at 1600m in Aust. Trigger Finger (g. by More Than Ready). 2 wins at 2 in Aust. Mrs Bignell (f. by God's Own). See below. Regal Choice (g. by Choisir). Placed at 3 in Aust. REGAL TOUCH (Touching Wood). 8 wins. See above. Always Something. 5 wins from 1000m to 1650m, HK$5,854,550, HKJC 125th Anniversary Cup H., HKJC Lung Fu Shan H., Daisy H., Siu Sai Wan H., Pitt H., 2d HKJC Centenary Challenge Cup, Police Cup, Chevalier Aluminium Engineering H., Hoi Yuen H., Shing Ping H., Wyndham H., Freesia H., Thierry Mugler H., Cleveland H.
Carry Good News. 3 wins at 1400m, 1650m, HKJC Ngong Ping H., Edinburgh H., Grass Island H., 2d HKJC Planet Ruler H., Nam Cheong H., Arbuthnot H., Liaoning H.
Grand Stand. 16 wins from 1000m to 1800m in Macau and U.A.E, Macau Star of the Sand S., Berlin H., Alain Prost H., Baguette H., Ashley H., Jilin H., Fukuoka H., Nad al Sheba Family & Favourites S., Macau Bath H., Whakatane H., Fukuoka H., 2d Macau Waverley H., Bath H., Autumn Trophy. Prince Gazelle. 5 wins to 1500m, BATC Owners H., 2d Avondale JC T-Shirt H.
Heez Leica. 4 wins from 1200m to 1600m, BOP RC Te Waiora a Tane Trust H., Matamata RC Broadway Motel H., 2d Hawkes Bay Total VJ Distributors H., Counties RC EA & JP Nicholls H., 3d Waikato RC Loch Haven Thoroughbreds H.
Governor Gazelle. 4 wins from 1600m to 2000m, A$83,480, VATC Legends of '45 Welter H., VRC Melbourne International Festival H., VATC Ming Dynasty H., 2d VRC Four'n Twenty Pies H., LU Simon Welter H., Aluminates H., 3d VRC Racing Show H.
Estuary - King of Win (H.K.). 3 wins at 1400m, 1650m, Manawatu RC GSA Design H., HKJC Lam Tei H., 2d Taranaki RC Budget Rental Cars H., HKJC Kowloon Bay H.
Happy 'n Gold. 5 wins from 1400m to 2100m, 3d Otago Thoroughbred Breeders H., Avondale JC Lynmall Juvenile S.
KINDALEICA (Captain Rio). 4 wins at 1400m, 1600m, NZ$94,425, to 2015-16, Avondale JC Karaka Classic, L, Taranaki RC Ekraar & Echoes of Heaven at Linwood Park S., 2d Matamata Cup, L, Pakuranga HC Bridges Insurance H., Taranaki RC ITM New Plymouh Building Supplies Interprovincial H.
Marlborough Sound. 4 wins from 1300m to 1600m in Macau. Colonial King. 12 wins from 1200m to 3200m, Counties RC Lion Breweries H., Matamata RC Barmac H. Sire. Race Record: 15 Starts 0-1-0 A$7,910. Placed in 2016-17 in Aust.